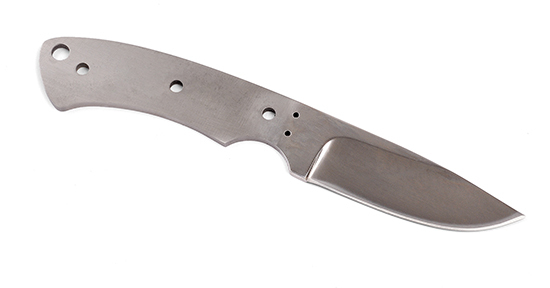 This blade has a mirror finish and is made from 440C stainless steel. The overall length is 7-3/4", the blade is 3-1/16" long, 1-1/16" wide, and 5/32" thick. The bolster holes are 3/32". The 350B, 450B, or 550B hidden bolts are a great choice for pin material; or use the 1/16" pins for bolsters, 3/16" pins for a handle, and 1/4" thong hole tubing. The blade has been CRYOGENICALLY TREATED to enhance its edge holding properties. Barstock - Copper 1/4" x 1" x 12"